Favorite Always Dreaming dominated at the 143rd Kentucky Derby. 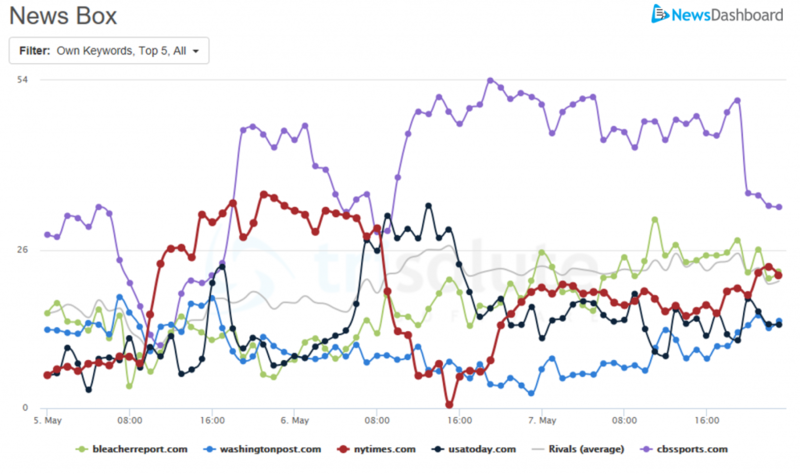 But who was the winner in the Google SERPs for news coverage of the Saturday, May 6, event? 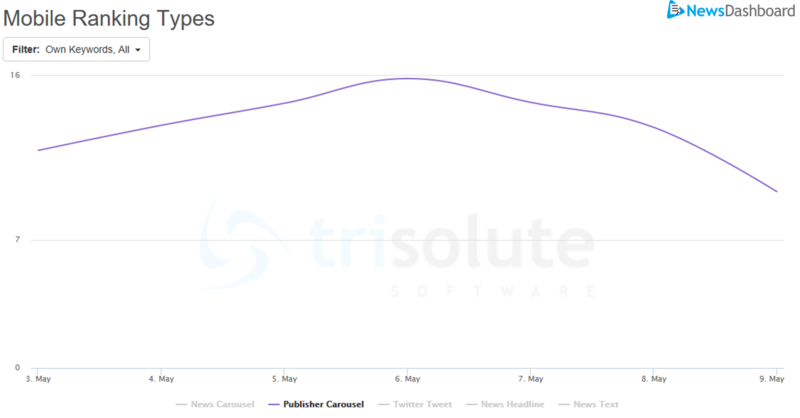 Using the News Dashboard from Trisolute, we did an event analysis (similar to the top 5 most impactful news publishers in Google for the 2017 Oscars) and checked the visibility and impact of the top 5 news publishers using our KPI Dashboard for mobile and desktop search results. We based the analysis on a list of 54 keywords. For the full list, scroll to the bottom of this post. Of the top 5 publishers in Google for Kentucky Derby news, CBS Sports was far and away the winner across mobile and desktop. Bleacher Report was often a close second, followed by USA TODAY, the Washington Post and the New York Times. Read on to see detailed examinations of how the publications fared for different kinds of news search results, and how other publications might benefit from their successes. Bleacher Report and CBS Sports duke it out for the top spot in the Google Mobile News Box for the 2017 Kentucky Derby, trailed by USA TODAY, the Washington Post and the New York Times. The highest visibility was actually the day after the race, as the search audience caught up from Saturday. News Dashboard measures News Box visibility as the total percentage a publisher’s articles ranked in the measured news boxes for the selected keyword set. Bleacher Report and CBS Sports led the day, with 58.37 percent and 56.68 percent, respectively. Rounding out the top 5 are USA TODAY with 49.84 percent, and a tie for the Washington Post and the New York Times at 25.84 percent. The highest visibility for the top 5 publishers in Mobile AMP Carousels for the 2017 Kentucky Derby actually came the day after the race. The story changes a bit when we consider visibility in the Mobile AMP carousels. AMP Carousels make up a big part of the mobile News Boxes, so it is not surprising to see that we see the same top players. But as News Boxes and AMP Carousels do not share everything, the curves are slightly different. Bleacher Report (68.45 percent) again leads the pack and CBS Sports (60.18 percent) has a spot in the Top 3, but USA TODAY (66.45 percent) gives them a run for their money on Sunday, May 7. Kentucky Derby 2017 winning horse Always Dreaming became a much more popular keyword for the Google News Box across the top 5 publishers for visibility after he won. While Always Dreaming was a favorite to win on Friday, the horse wasn’t the most covered keyword by itself. 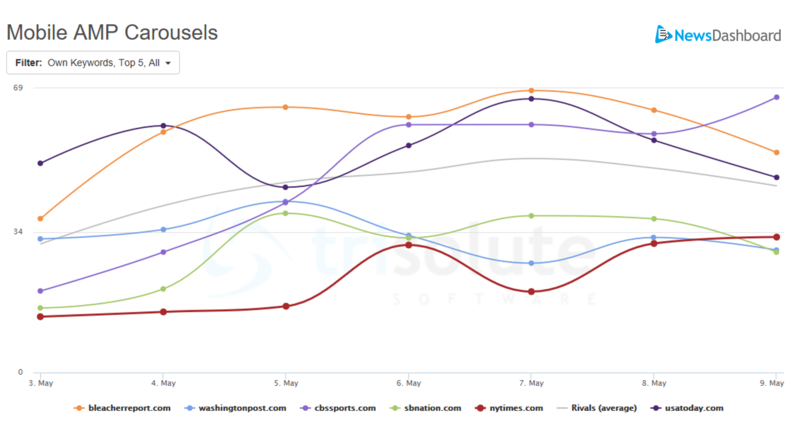 However, as the race got started and news came down that he won, he became a much more popular keyword across all the top 5 publications in mobile. 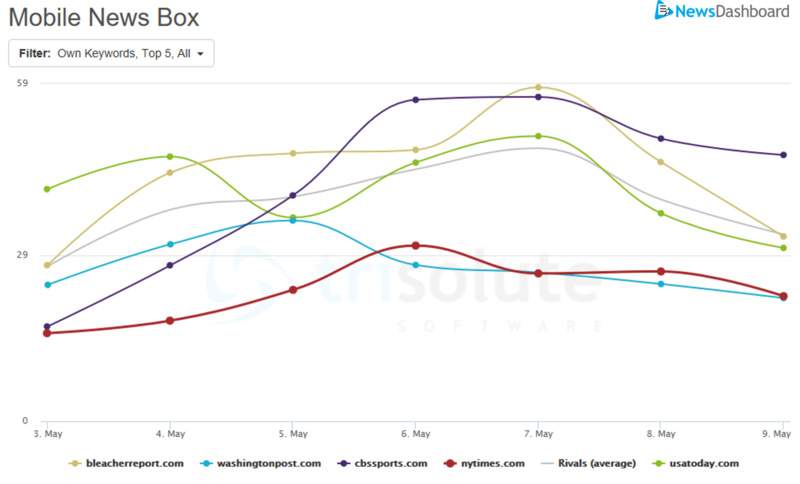 About 16 percent of the mobile SERPS on race day for the Derby included a Publisher Carousel. We then drilled down the placement in the single-source or Publisher Carousels and saw how much impact they had for the Derby. About a sixth of all mobile news SERPs include one or more Publisher Carousels. For Friday through Sunday, Publisher Carousels were part of 14.49-15.84 percent of Kentucky Derby mobile SERPs that were measured. Once again, the most single-source carousels go to CBS Sports. There are a couple of new contenders just in this category: Forbes, Pinterest and MLB.com. The publishers had visibility scores from under 1 percent to 6.8 percent. 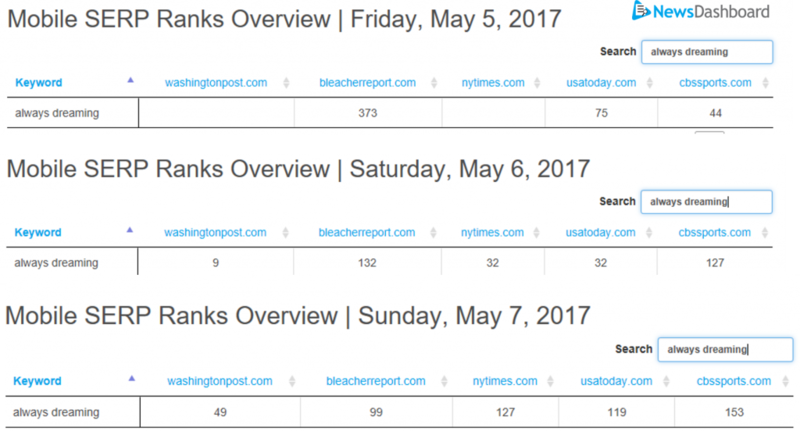 Looking just at the three-day period around the Kentucky Derby by every eight hours, competition was the steepest between the publishers in the morning on Saturday, May 6, 2017. It’s little surprise at this point that CBS Sports dominated the News Boxes for desktop, too. We can see that the competition really heats up on the morning of the Kentucky Derby, then evens back out after the race and into Sunday. For race day, CBS sports leads with 43.89 percent visibility, followed by a precipitous drop to 19.98 percent for USA TODAY, 17.92 percent for the New York Times (their best showing in this analysis), 14.98 for Bleacher Report and 7.15 percent for the Washington Post. 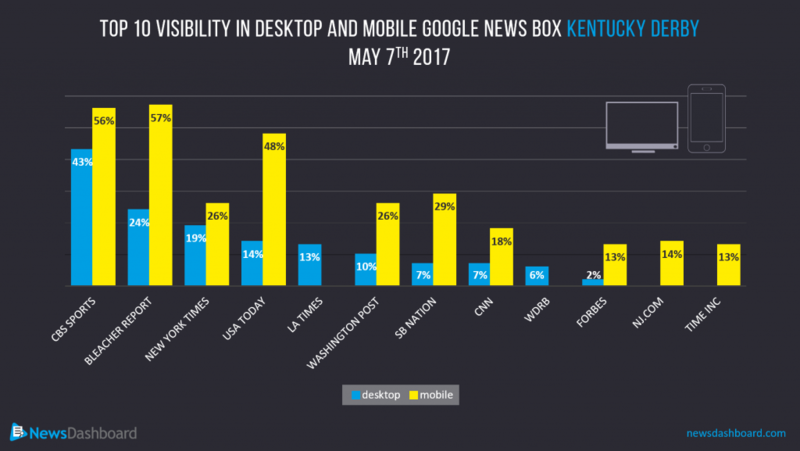 CBS Sports and Bleacher Report are the top U.S. news publishers for visibility in the desktop and mobile Google News Boxes for the Kentucky Derby on May 6, 2017. Again, the top performers in mobile and desktop turned out to be similar. Sports-specific publications took the day with the Kentucky Derby, which isn’t too much of a surprise. And none of the top 5 publishers are based out of Louisville, instead being national sports/news sites. Keyword set “Kentucky Derby 2017”: kentucky derby, 2017 kentucky derby, kentucky derby 2017, louisville, what is the kentucky derby, kentucky derby results, kentucky derby fashion, kentucky derby odds, when is the kentucky derby, kentucky, horse racing, horses, churchill downs, saturday may 6 2017, post positions, post time, number 1 post, number 5 post, number 10 post, luckiest posts, empire, 143rd kentucky derby, horse race, kentucky derby picks, kentucky derby horses, how to watch the kentucky derby, jockeys, champion jockey, contenders, entries, schedule, tickets, long shots, long shot, horse trainer, one-eyed horse, patch, underdog, blind patch, kentucky derby favorites, mint juleps, Always Dreaming, McCraken, Irish War Cry, Gunnevera, thunder snow, irap, Gormley, equine, national anthem, Harry Connick Jr., Kentucky Oaks, Saturday card, Louisville Ky.